This was published as a Wall Street Journal Think Tank column on September 17, 2014. This week President Barack Obama announced that the U.S. military would dramatically scale up its engagement in the response to the Ebola outbreak in West Africa, the worst ever such outbreak to occur. Up to 3,000 military personnel could be deployed to the region over the next several months to help build clinics, train local health workers, assist with logistics and transport, and strengthen safe handling and laboratory testing of the virus. The initiative builds on the efforts already under way, and complements the funding, materials, and expertise coming from the U.S. and many other countries and aid organizations. DOD spent more than $580 million on global health-related activities in 2012, an amount greater than outlays by either the Centers for Disease Control and Prevention or the National Institutes of Health for global health that year. But much of this effort has been done in the background. What is new with the president’s announcement is that the department is being tapped explicitly to address an international public health crisis — a first. 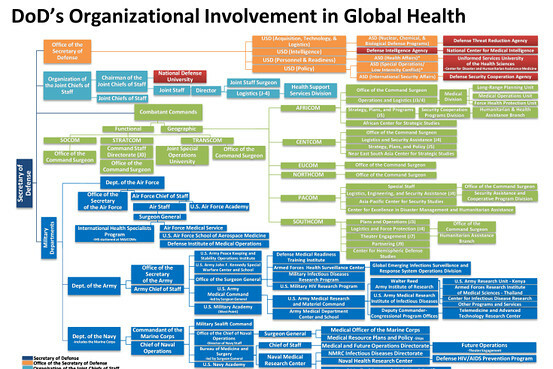 The DOD is not a development agency, and improving global health is not one of its core objectives. Its primary mission is to provide the military forces to protect the U.S., and the primary mission of its health-related activities is to protect American troops and win hearts and minds around the world. At the same time, the DOD is often uniquely situated to take the lead on urgent global health crises. Even before the Ebola outbreak, it had begun to make a concerted effort to bolster its internal global health capacity and organization. The effort to tackle the Ebola outbreak thus far has lacked clear leadership and coordination, or the resources to “get ahead” of the exploding number of cases. In the aftermath of Hurricane Katrina along the Gulf Coast, the country waited for a response and then saw the critical role the military can uniquely play in a public-health emergency. By involving the military in this way, President Obama has acknowledged that perhaps the DOD can quickly deploy the resources and the capabilities needed to help change the trajectory of the epidemic.